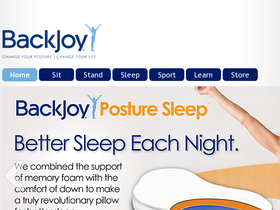 Turn to BackJoy, online at backjoy.com, for revolutionary products designed to improve your posture and back health. BackJoy offers portable seats which help individuals sit longer more comfortably with less strain, comfort insoles that relieve pressure points, posture sleep pillows, and more. BackJoy is dedicated to helping people enjoy life with a more balanced body and with less pain. But before you shop, get all the latest BackJoy.com discounts, BackJoy promotions, and BackJoy coupon codes found here at RetailSteal.com. Save $30 on the Comfort Collection from BackJoy. Use this coupon code to enjoy. Enjoy a free stress roller, a $19.99 value, with your purchase at BackJoy. Click link now to shop and use coupon code to save. Enjoy free shipping with all orders at BackJoy. Click here to enjoy better posture and pain relief. Shop at BackJoy and enjoy their Comfort Insoles for only $20. Get started today and relieve pressure points and more. Reduce the pressure of kneeling with the BackJoy Kneeler. Click here to get it for only $20 from BackJoy.com. Get the BackJoy Posture+ Seat for only $40 at BackJoy.com. Click like for this comfortable, posture improving seat. Correct sitting posture with this portable back orthotic with memory foam. Click here to get it for $60 from BackJoy. Save 25% when you purchase 2 Backjoys at Backjoy.com and use this code at checkout. Click to save.